Foundation Repair Peoria, IL | Kelley Construction Contractors, Inc. Some common signs of foundation failure include cracking, settling, sticking doors and windows, and uneven floors. If you suspect a foundation problem, contact us today. The easiest way to bring anything down is to start at its foundation. The same holds true for your residence or business. The maintenance of your structure’s foundation is critical to its longevity. 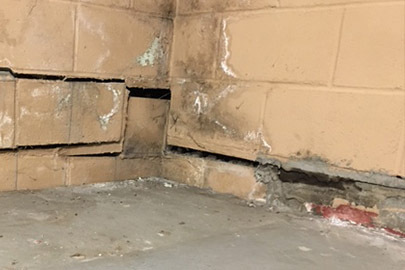 At Kelley Construction Contractors, Inc., we offer a complete line of foundation repair services, administered by experienced professionals, to ensure your residence or business continues to stand strong, well into the future. Our services include waterproofing foundation walls, straightening walls and rebuilding walls. Why Kelley Construction for my foundation repair? Read more about what makes us different from the rest and check out our testimonials from those who have experienced the Kelley Difference for themselves. What are the signs my foundation might need repaired? If you notice any of these issues, don’t hesitate to take action — especially during warmer months. Foundations can’t be repaired when the ground is frozen so make sure to keep an eye out and address any issues before winter. Call us today and see how we can make your foundation stronger than ever!